Laurene Klassen grew up in New England but came to Texas as fast as she could. SMU was one of the first spots she visited in Dallas. Laurene is a Microsoft Certified Trainer and Manager of SMU’s IT Training & Communications Team. In her spare time, she enjoys hiking and outdoor activities with her family. 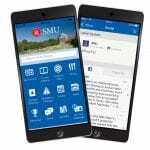 While many of the SMU faculty transitioned to Canvas last year, we recognize some may not yet have had the opportunity to check out our new Learning Management System. With back-to-school gearing up, consider posting your syllabus for students in Canvas since a course shell is automatically created in Canvas for you to host your course content.